Wednesday January 29th 1896 Will Woolf brought out hogs he had sold to Will and helped them take ours back. They sold four loads or 20 hogs that brought $251.10. It was late when they got home for dinner but Will and I went back to town a little while. I went to Aid society. Uncle Jim and Minnie Muckler spent the evening here. Thursday January 30th 1896 Will went over to Woolfs for dinner and to pay Will for his hogs. I put in all my spare time sewing today. Mr Robinson was out to get butter for Fanny Graham in the afternoon. Will was up home too and found the folks well pleased with the sale of the hogs. Friday January 31st 1896 I was busy with the work most of the forenoon. After an early dinner the boys both went to town. I put in the afternoon and evening at my sewing. It rained most of the forenoon. Saturday February 1st 1896 Weather brighter this morning. The boys went over to Uncle Jims for my white turkeys. I was hard at work till three oclock in the afternoon with sweeping, dusting and the baking. Will spent the day in town. I sewed in the evening. 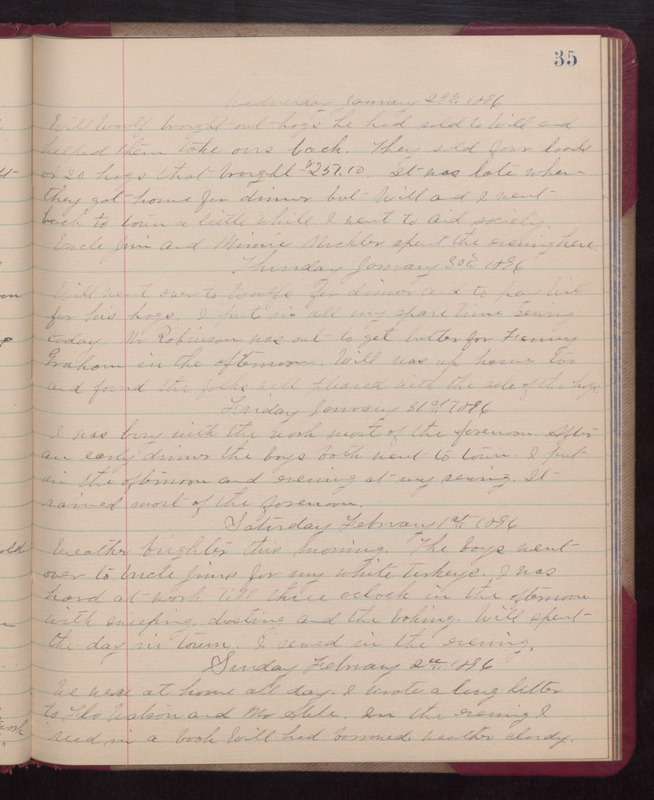 Sunday February 2nd 1896 We were at home all day. I wrote a long letter to Flo Watson and Mr. Able. In the evening I read in a book Will had borrowed. Weather cloudy.